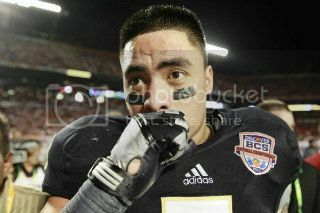 Xtrology » MANTI TE’O JUST SCARED? The Notre Dame athlete in the news is Manti Te’o. He seems to be the victim of an Internet love scam. But is he? First he is only 22, birthday today. And his Sun and Venus are Aquarius. This is the worst kind of Aquarian. Already the coldest sign in the zodiac, add a chilly Venus placement, and they just don’t care that much. This type usually won’t chase you. You either fall into their lap or forget about it. So it does make sense that this girl was conveniently stalking him by phone and email. So when she didn’t show up to meet him, Manti shrugged it off — may even have preferred it. And with four planets in Capricorn: Uranus, Neptune, Mercury (Neptune conjunct Mercury = a deceptive way of talking), and Saturn, he’s ambitious. His focal planet is fixed Pluto — intensity, stamina and focus. I think he was duped, but we’re all getting a sense that the Heisman Trophy was not too far from his mind. So he jumped on the “my grandmother and girlfriend died of cancer thing” pretty easily. (The latter turned out not to be dead or a girl.) Pluto makes him overly focused and not good at changing lanes. There is also a great deal of emotional self-control exacerbating the Aquarius thing. Only one of his natal planets has moved out-of-sign. That would be Venus, and earlier it made three positive aspects. And then there is Saturn. Since it started at high degrees, it has moved to the next sign. There it is making an aspect to his predictive Mars, a trine. This is good energy. He’s going to be embarrassed and the trophy is probably history, but he’ll come out of this okay. He’s young. He got fooled. And he is just not that flexible — can’t think on his feet. Hey, he’s a football player not a rocket scientist. Lower your expectations. For private consultations, contact melanie@xtrology.com. And please visit Xtrology on Facebook and Twitter.